Trying to find a decent domain name can be difficult, but it need not be. 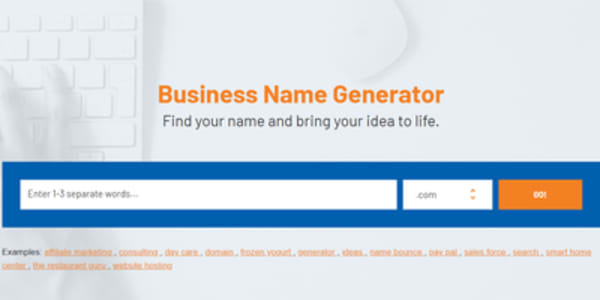 Use one, or more, of these business name generators to find your perfect domain name. Last updated: Apr 12, 2019. 11:22 +0100. A domain name serves as your identity on the web. Choosing the perfect domain name that is not only catchy, brandable and easy to remember, but one that is also available is hard. 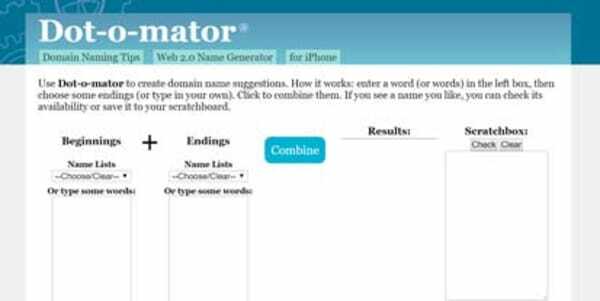 Fortunately, you can use an online name generator tool that provides you with some suggested names based on one or more submitted keywords. 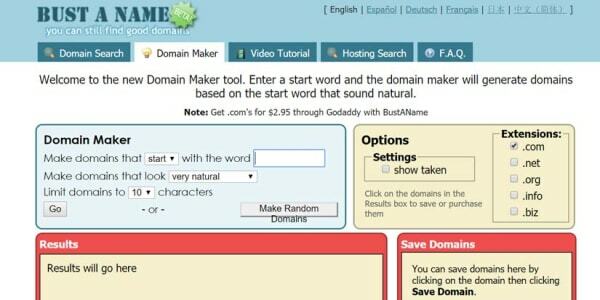 The tools usually tell you if the domain is available, making it quick and easy to create a unique and creative domain name suggestions for your website. 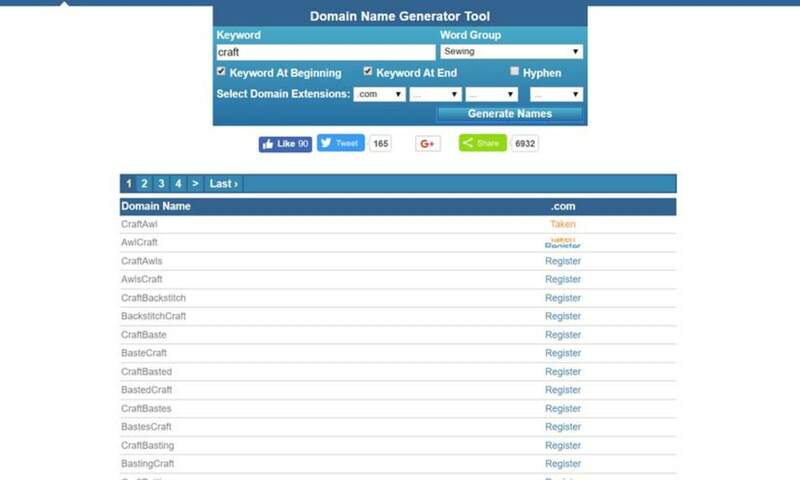 In this article, I have listed all the free domain name generator tools I could find (there are quite a few), along with a summary of their features, usability, etc. I have also added a screenshot showing an example search. 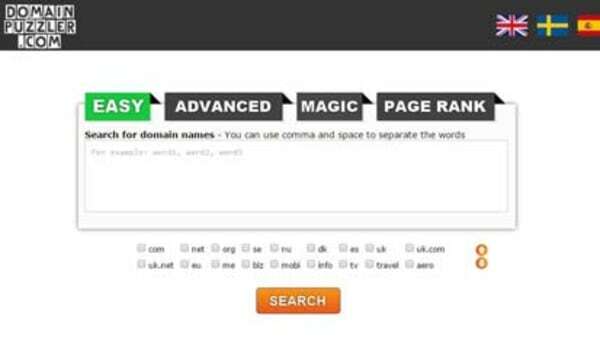 Once you have found your perfect domain name, I recommend one of the following domain registrars: GoDaddy or Namecheap. I have created a detailed guide on how to register your domain name with these registrars, which include discounts ($0.99 .com) and instructions on configuring your name servers. To use Panabee, enter any keyword in the search box and select from a number of options (I’ll highlight these in a moment). Alternatively, the tool acts as a random domain name generator, although I am not sure I would recommend going that route. The suggested domains are varied, and complex in scope. The tool provides an extensive list of suggestions based on many weird and wonderful rules such as “append ific,” “append io,” “misspell i as y,” “slang z” and more. This truly is brilliant. A list of related terms is provided so you can rerun the tool for more ideas. The tool is straightforward to use as there are virtually no options available. However, it produces some of the best results. 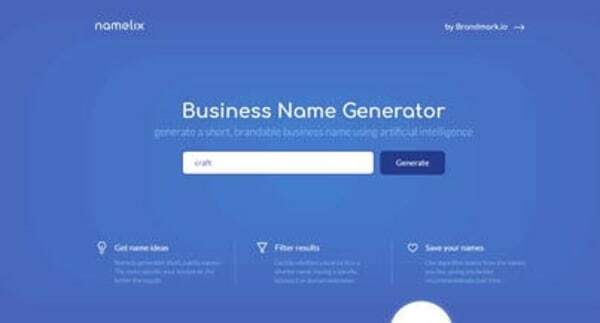 Overall, this is one of the best domain name generators I have found to generate random domain ideas. The tool explains the method they use for creating each of the suggestions, and you end up with some completely random, but sensible ideas. This has to be one of my favorites. To use Name Mesh, enter any keyword (it works best when you add multiple keywords) in the search box. On the results screen, you will see the results by suggestion style (New TLD, Short, fun, etc.). You can at this stage select the maximum length of the domain name, and detailed suggestions for .io, .co and .net domain extensions. The suggestions are quite varied and are collated into different styles. I like this a lot. There is minimal filtering ability. It can function as a short domain name generator by limiting the number of characters available. The only issue is that some of the very short domains (2 or 3 letter words) appear to be available to register, but they are not. 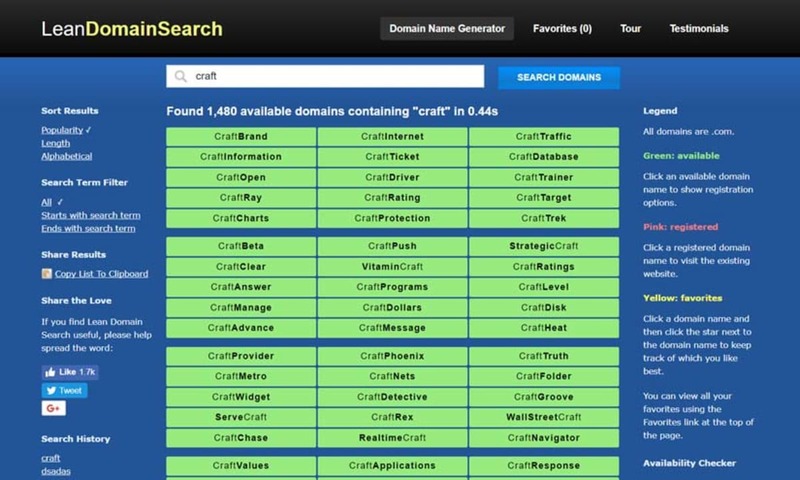 Overall, this is one of my favorite domain name search tools. It is very simple with limited options, but it does it differently to all the other tools. The collation into suggestion types is very good, and it does appear to have much more useful suggestions as a result. To use Lean domain search, enter any keyword in the search box. 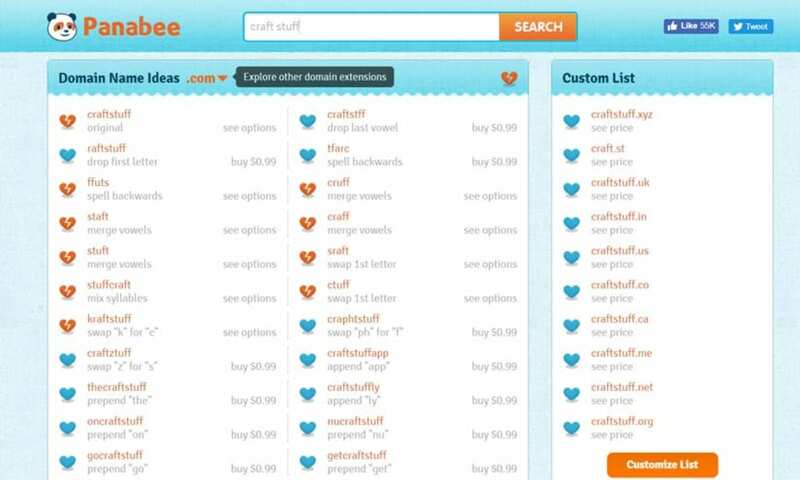 Within seconds you will see hundreds of creative domain name ideas. The search tool allows you to combine your keyword with another by either appended or prepended it. This makes it a useful tool if you want to use your particular keyword in your domain, but not very helpful if you are looking for something a little different. The domain availability feature only searches for .com domains, so is not so useful if you are considering one of the new TLD’s or simply your country code TLD. There is some basic sort functionality allowing you to choose based on length, alphabet or popular domain. You can filter based on whether your keyword is placed at the beginning or the end of the suggested domain. Overall, the suggestions seem to be decent, with very few nonsense ideas. To use Bust a Name, enter any keyword in the search box and select from a number of options (I’ll highlight these in a moment). Alternatively, the tool acts as a random domain name generator, although I am not sure I would recommend going that route. The suggested domains are relatively basic in scope, with your keyword either appended or prepended onto another word. You will need to do multiple searches with different options, as you can only choose one or the other. You can check whether the domain is available for .com, .net, .org, .info and .biz domains. You can even see what domains have already been taken if you tick the “show taken” option. There is no sorting or filtering functionality, but instead, you can choose the length of the domain, and “naturality” when configuring the tool. The tool provides a list of “Similar Words to Try,” which I think is quite useful. Overall, the suggestions seem to be decent, with the “someone natural” setting creating an alternative approach to having readable domains consisting of proper words. This may be worth checking out, as my trial of this yielded some interesting possibilities. 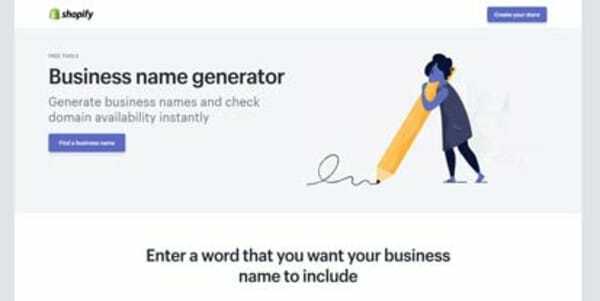 To use Shopify’s Business Name Generator, enter any keyword in the search box. There are no other options available. The suggested domains are relatively basic in scope, with your keyword either appended or prepended onto another word. 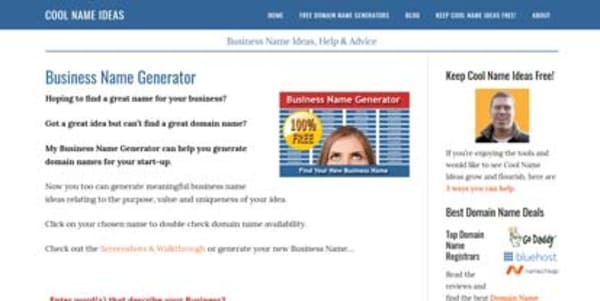 The Business Name suggestions are displayed as a brand name (i.e., with spaces, capitalization). The tool only suggests names that have an available .com extension. Overall, a straightforward and basic tool that provides sensible suggestions. Use a Primary & Secondary keyword. The suggested domains are created using a variety of methods. These include misspellings and similar sounding keywords. You can check whether the domain is availabile for .com, .net, .org, .info and .biz domains. The tool will show the availability of premium aftermarket domains that you can purchase immediately from namemedia.com. 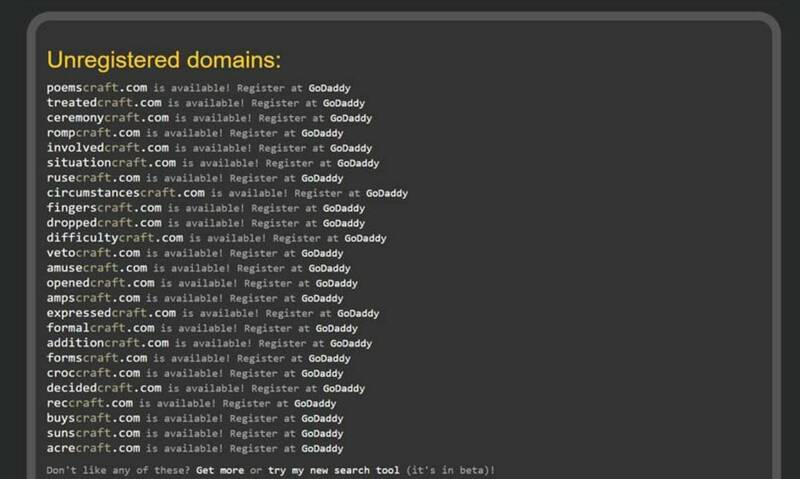 The domain name generator will even search for expired and expiring domains. Overall, this is quite a powerful tool. Its suggestions appear to be a little more sophisticated than its competitors. I recommend trying it out if you wish to find a cool domain name. To use Nameboy, enter a Primary keyword in the search box, choose Word Group (if required), and select keyword placement options. The proposed domain names are relatively simple in scope, with keywords either added to the beginning or the end. The ability to choose from different Word Groups is very powerful and perfect for narrowing down choices. You can select popular words, smart misspellings, objects, topics, parts of speech, to mention a few. You have two main options here; Firstly, the “Advanced” search, which requires you to add a list of words to combine with a primary keyword. Secondly, the “Magic” search automatically combines your keyword with popular words. If you already have a long list of words you wish to try and combine, this may help find available domains. However, the accuracy of the available domains was poor. The Magic tool is untested because it failed to work. Overall, this tool was of poor quality. The “Magic” popular word option failed to work. 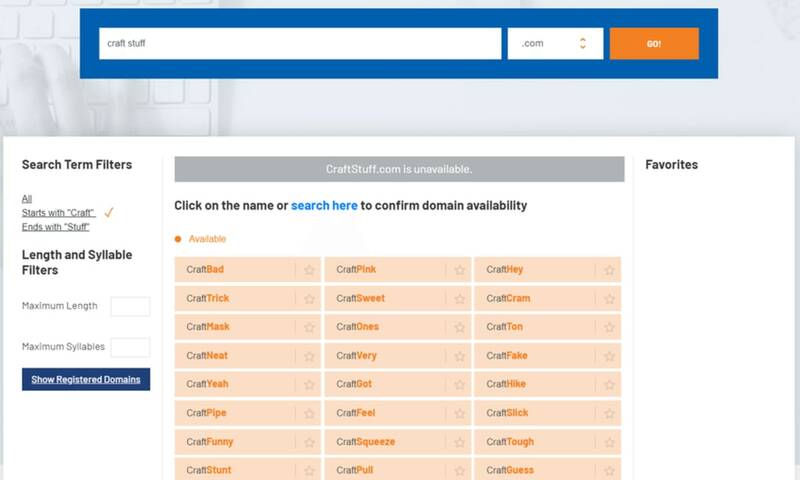 When searching for domain ideas using a random set of keywords I entered in manually, it said certain domains were available even though they were taken. There is no example screenshot as it does not work. You can add specific keywords. 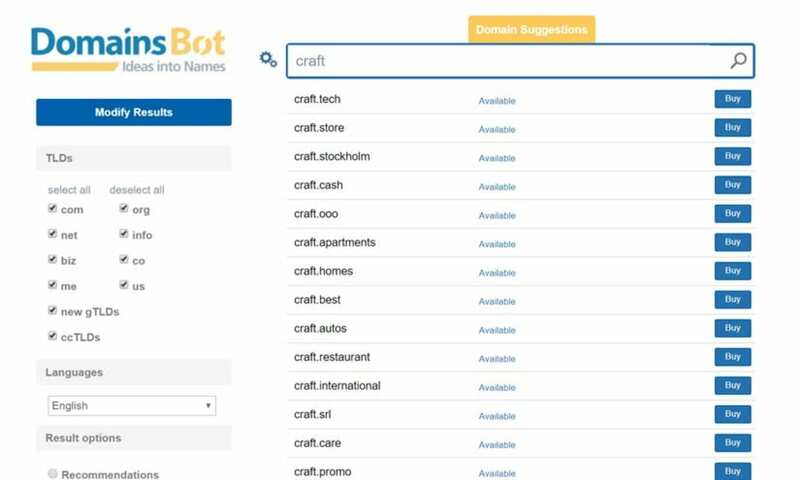 To use Domains Bot, enter any keyword in the search box and select the type of TLD’s you wish to search (includes new gTLDs, and ccTLDs). You can add synonyms as prefixes or suffixes. The domain name generator does a great job at suggestion new gTLDs, and as a result, there could be some very short names available (i.e., 5 or 6 words). Availability of all the domains is checked upon search. The tool is integrated with Sedo to provide a good selection of Premium Domains. However, for the price (several thousand dollars) some of the premium suggestions were less than inspiring. Overall, if you want to use a new gTLD, then this might come up with good ideas. Otherwise, I don’t think this tool is one of the best. The suggestions for .com domains only were pretty uninspiring. To use Name Station, enter any keyword in the search box, followed by any secondary keywords (optional). On the results screen you will be able to filter from a range of options under three categories; Compound words, Tweaked words, and Made-up names. Also, you can narrow the suggestions further by choosing from a large selection of word lists. The “Compound words” domain name suggestions were very cleverly done. The tool was not limited to using your specified keyword, and correctly picked up the intent of the keyword. You can filter these specific results by suffixes, prefixes, word list selection, hand-picked names, popular affixes, related words, conceptual names, plurals, and alternative names. The “Tweaked words” domain name suggestions were the most interesting, and if you want a made-up domain name, then it does a respectable job. The “Made-up names” were what you might typically expect. Complete random nonsense that on our test run revealed nothing remotely usable. 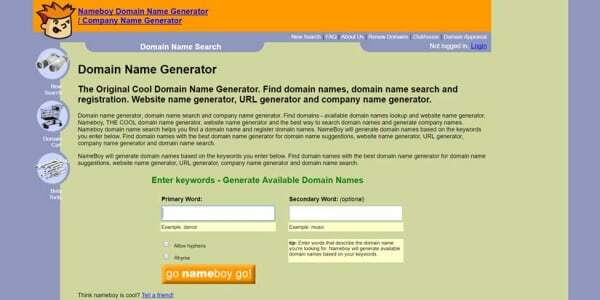 However, you can keep clicking “Generate” to create some more random domain name ideas, so who knows. You may get lucky. Overall, this is one of my favorite tools, with some very good suggestions. To use Impossibility!, enter any keyword in the search box and select the type of word to either add to the beginning or the end. The suggested domains are relatively basic in scope, as it only allows you to combine words using your keyword as a prefix and suffix. You can check the domain availability for .com domains. There is no sorting or filtering functionality. The only options are to choose the type of word to prepend or append. You can choose 4, 5 or 6 letter adjectives, verbs or nouns. Or, you can select all of them at once for more random results. Overall, this is not the best domain name generator tool regarding functionality, but the names suggested were reasonable. To use Instant Domain Search add your keyword to the search box. There are no other options available. 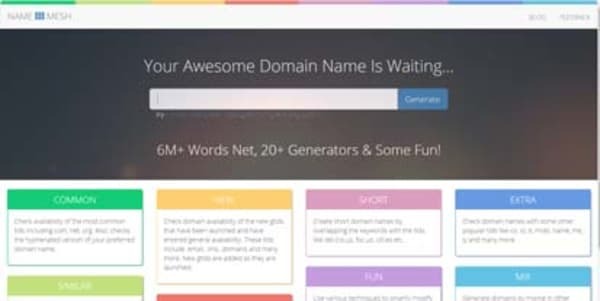 This tool provides some very creative domain ideas. It does not simply prepend or append a keyword but instead will suggest domains using related words as well. 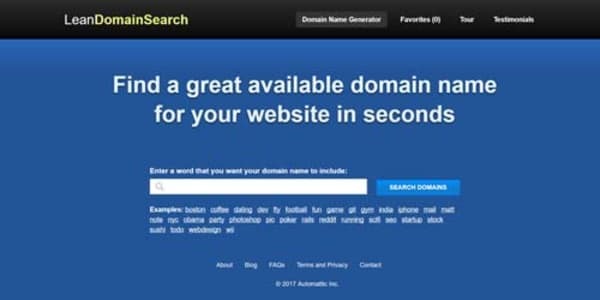 This is a potent tool if you are looking for a cool domain name using the new domain name extensions. 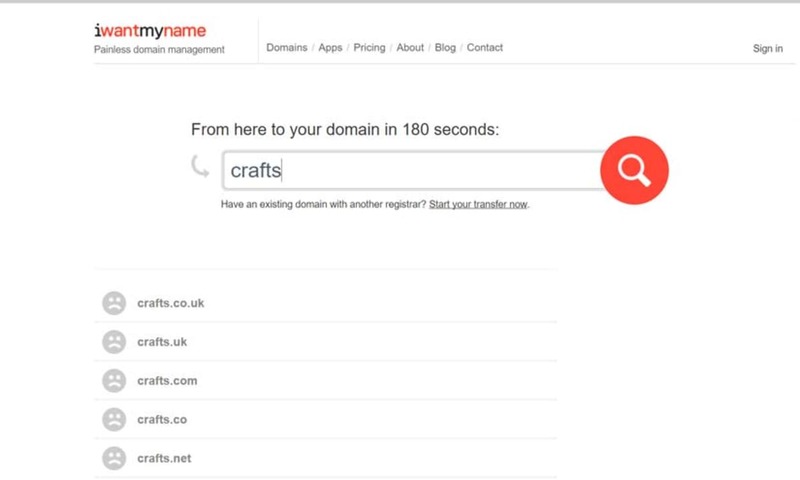 As the name implies, it will check domain names instantly as you type. Overall, I like this tool a lot. It is straightforward but provides quite a few unique suggestions over other tools. To use I Want My Name, input in your dictionary or made-up word into the search box and click the search button. There are no options. 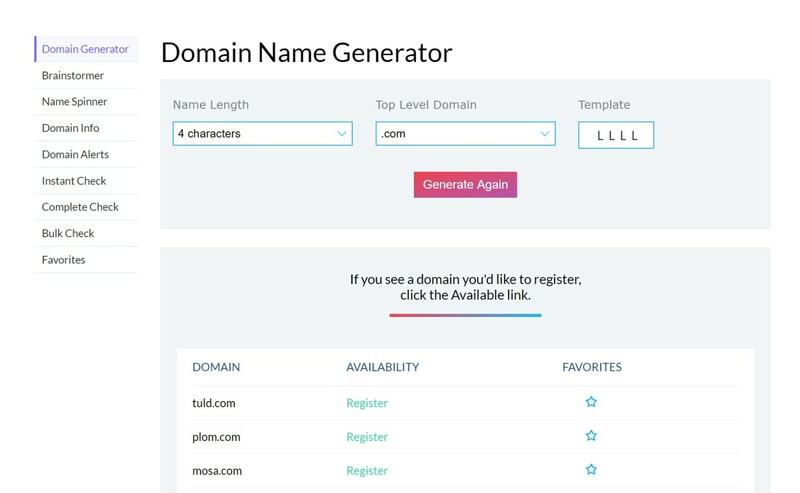 I don’t know why this tool has made it onto so many lists of popular domain name generators, but it appears to be a standard domain registrar tools that allow you to search domain names. 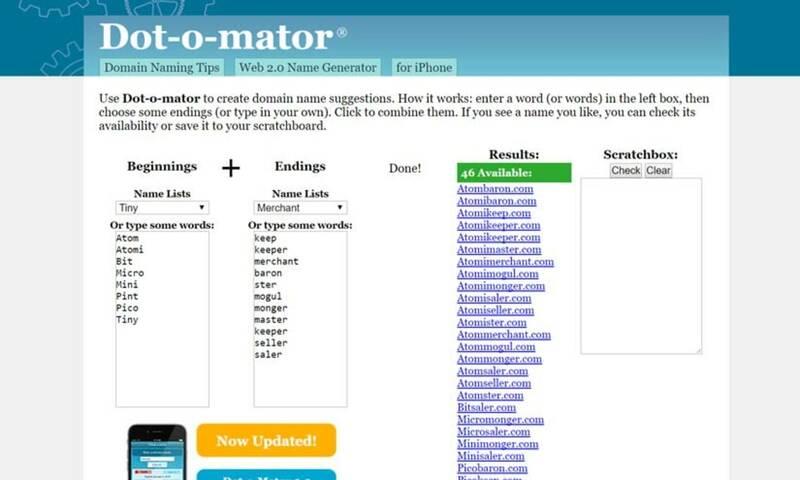 To use Dot-o-Mator select a beginning word or word list, and an ending word or word list. It will then generate available domain names. I have found that the tool works best when you add your own keyword as one of these options, along with your chosen word list for the other option. The suggested domains are relatively basic in scope, with any keyword being added as a prefix and suffix depending on your settings. Essentially, the tool allows you to combine words that you specify, or from the lists you define. The tool only shows suggestions if the .com domain name is available. Overall, I was not overly impressed by this tool. The number of proposals for each dictionary word list was extremely limited, and with many of the ideas already taken most of my searches revealed only a couple of available domain names. It would appear the business name questions trigger various keyword lists, rather than anything overly sophisticated. However, I found that the tool does seem fairly good, and you may just see a great domain suggestion. You can check the domain availability for .com, .net, .org, .info and .biz domains. A few advanced features allow you to place your keyword in the middle, beginning or end of the company names suggested. You can also limit the domain length by character length, allowing you to search for short domain names. Overall, the domain name search appears to be fairly good, with a large number of suggestions being made. Premium Domain Names, with pricing. 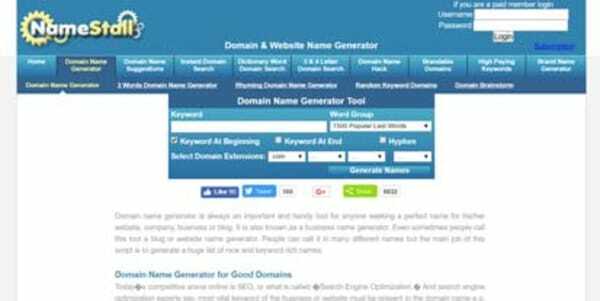 Namelix is a domain name generator tool created by the company Brandmark.io. Brandmark is an automated Logo design service that can create a unique, professional looking logo from just a few pieces of information, such as Brand Name and keywords. 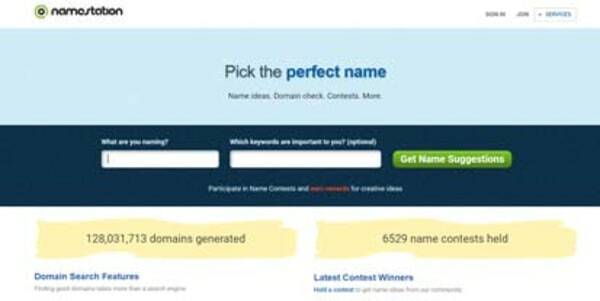 With Namelix, not only do you get domain name ideas, but you also get those ideas presented together with an example logo. Now, I am not saying you will like the logos for their suggested words, but I think it really helps visualize the name, and who knows, maybe provide you with some inspiration. After entering your initial request, you can further refine by adding more related words, adding negative words, choosing shorter names, keywords, and checking for domain name availability. 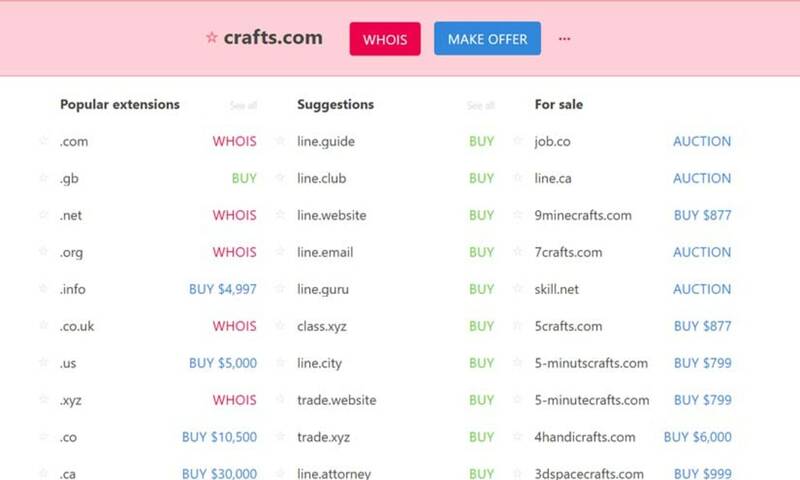 All the main domain name extensions are available, such as .com, .io, .ai, .com, .net, etc. However, the new domain suffixes are not available. The tool provides significantly better results when adding multiple keywords. 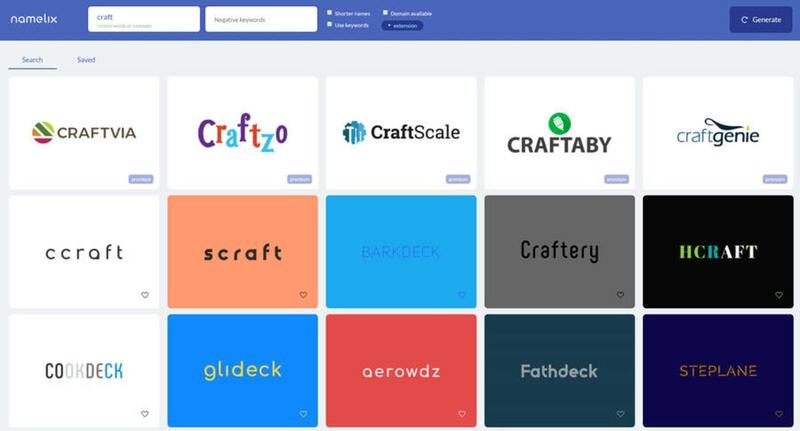 The tool uses Artificial Intelligence (AI) to generate short, brandable domain name ideas. Overall, the domain name search tool is very good. It has a large number of suggestions that can be refined. I am impressed. You can choose from three different tools. Choose randomly based on character length and type. Name spinner based on keyword and combination of words, verbs, popular appends, and more. 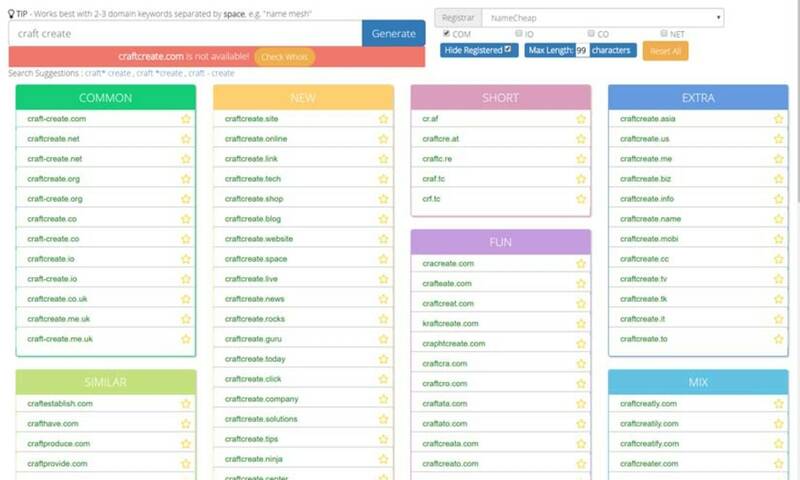 Domainhole is a company that specializes in selling expired, or expiring domains with a suite of features for this purpose, including domain metrics. This uses an interesting method, whereby you choose the Name Length, the TLD, and a template consisting of Letters, Consonants and Vowels. The accuracy of whether a domain is taken is poor. You can choose a domain length of 4 to 10 characters, or the range 5-10 characters. You can choose the location of Vowels, Consonants, and Letters. Most of the names generated were jibberish and of poor quality. 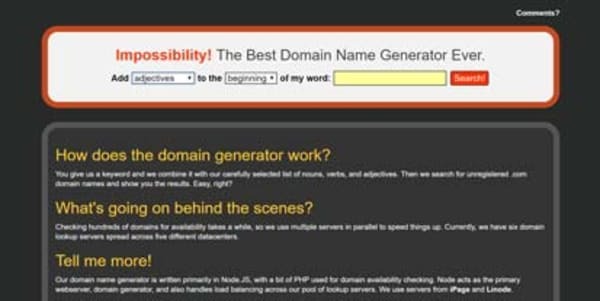 The tool uses a keyword to brainstorm domain name ideas. 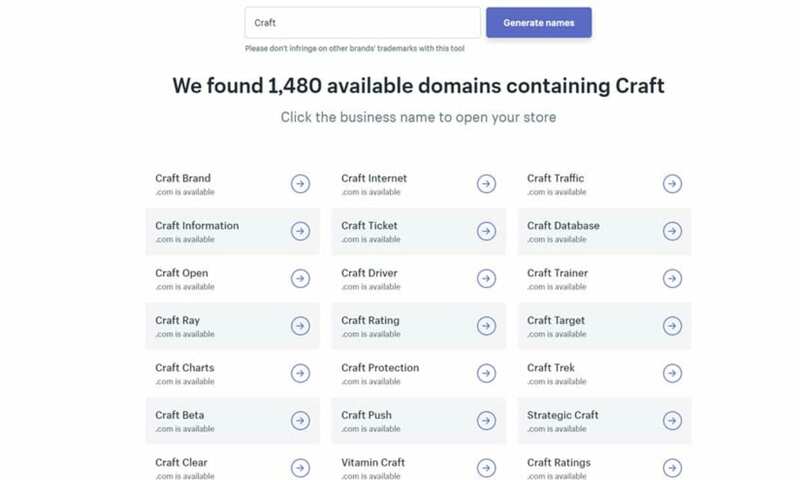 It provides suggestions for popular TLDs, including new TLDs, spelling variations, expired domains, name spinning, and a list of similar words so you can rerun the tool. Includes premium domains for sale. Domain name availability is not accurate. Most suggestions are jibberish, and not brandable. The name spinner provided the best suggestions. 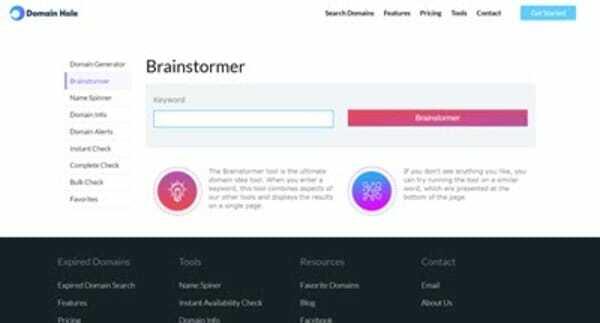 The Brainstormer tool included some suggestions from the Name Spinner Tool. Overall, the Name Spinner suggestions were superior to the other methods. 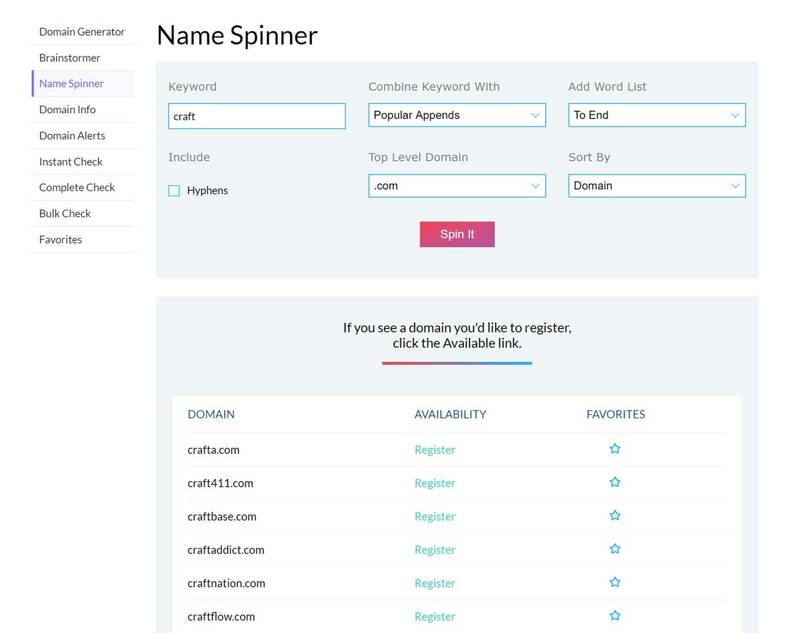 The Name Spinner Tool has additional configuration options, including keyword, hyphens, combining with other words, added word location, and works with nine popular TLDs. Add your keyword to get started. Choice of 9 TLDs including .com, .net, .org, .us, .info, .me, and .biz. Choose word type to combine with your chosen keyword, such as nouns, motivational words, popular words, etc. Choose to add the added word in the middle, beginning, or at the end of your keyword. Overall this tool provided some decent suggestions. Whois Information available on taken domains. Plus make offer. 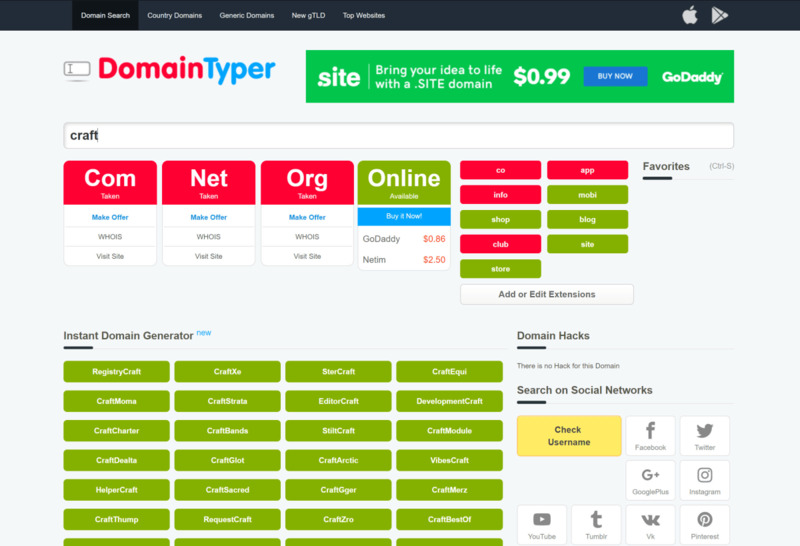 DomainTyper is one of my favorite domain name generators. One of my biggest annoynances with other tools is that the domain name checking functionality is inaccurate. DomainTyper works perfectly. While it does cache domain name availability, you can hover over any suggestion and select “Double Check Availability”. 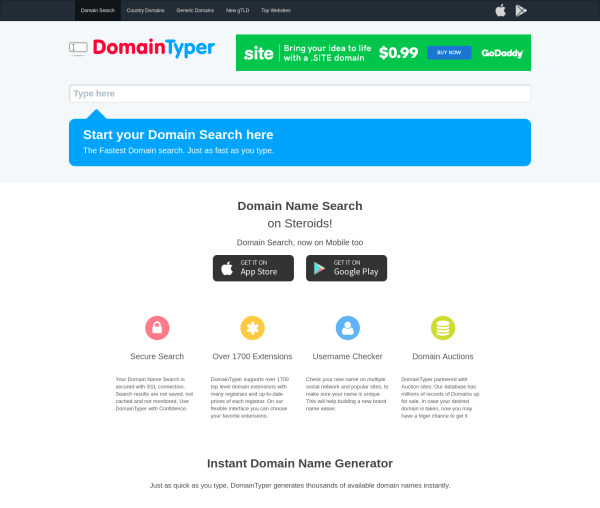 DomainTyper is perfectly named as an Instant Domain Generator. As you start typing you will see the suggestions update with every letter. One of the best features is the favorites feature. 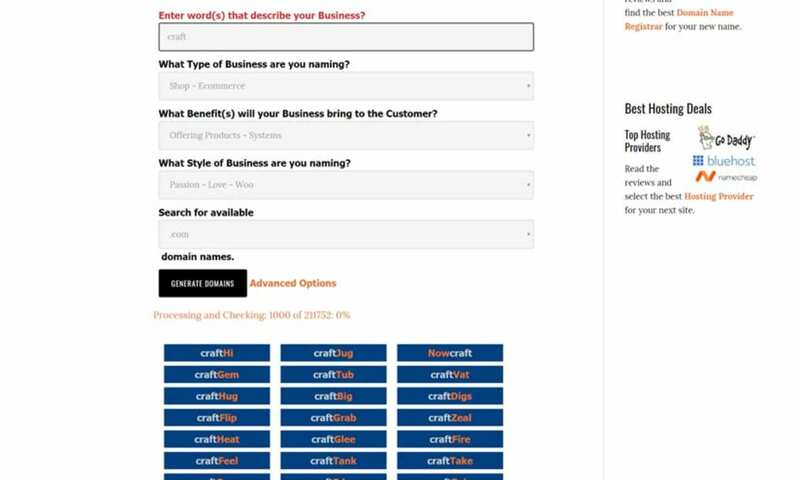 You can add domain names and extensions to shortlists to help manage your ideas. The suggestions are helpful, with some very good suggestions, and no gibberish. The tool will tell you whether the domain has previously been reported as hacked. You can check social media to see if your suggested domain name is available for all your Social Media accounts. This is very useful. 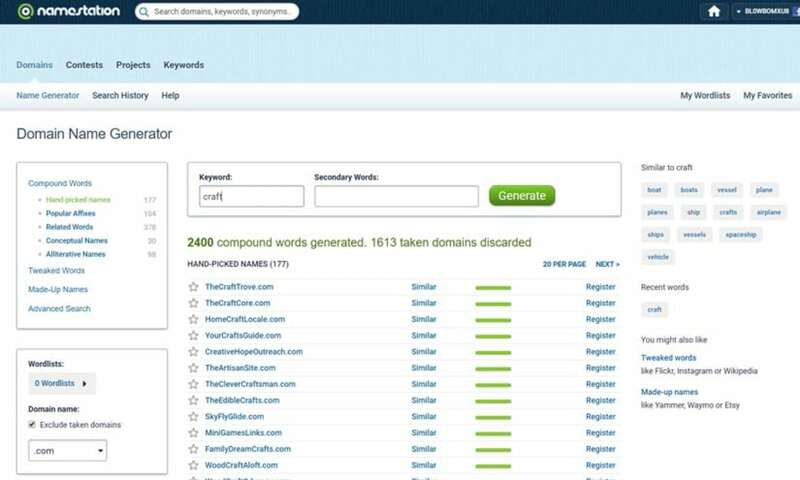 To use NameBounce, enter 1-3 keywords into the search box. 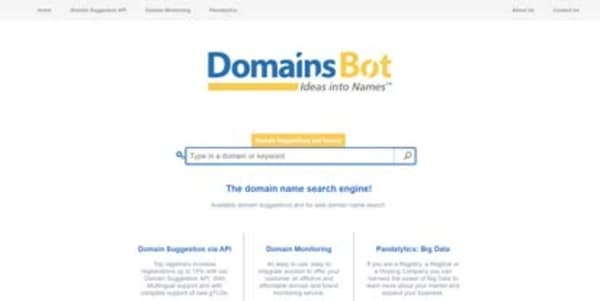 Within seconds, NameBounce will present you with hundreds of relevant domain name suggestions. If you enter 1 keyword, the tool adds popular prefixes and suffixes to the keyword you enter. If you enter 2 or 3 keywords, the tool replaces one of the keywords you enter with similar related words. You can generate domain names for country code TLDs such as .co.uk, .in, and .nl. You can filter the results by starting word, ending word, length, and syllable count. The initial search isn’t 100% accurate, particularly for the CCTLDs, but you can click on a name to double-check that it is available. Overall, this is a great tool. It’s easy to use, is one of the few generators that will search CCTLDs, and offers good filtering options.